WYK Spill Response Kits for every application. 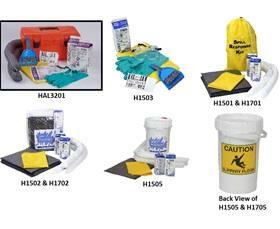 WYK Spill Kits help meet requirements of OSHA 1910.22, Parts 1, 2 & 3 on walking and working surfaces. Free full color wall poster available with your purchase - call for details. Don't see what you want, just ask and receive a free quote on what your specific application needs. For small spills and drips up to 14 gallons capacity WYK Mini Spill Kits and Vehicle Spill Kits are perfect. H1505 kit features a "Caution Sign" on the back of the pail for use as a "Slippery Floor" sign. FOB Shipping Point. 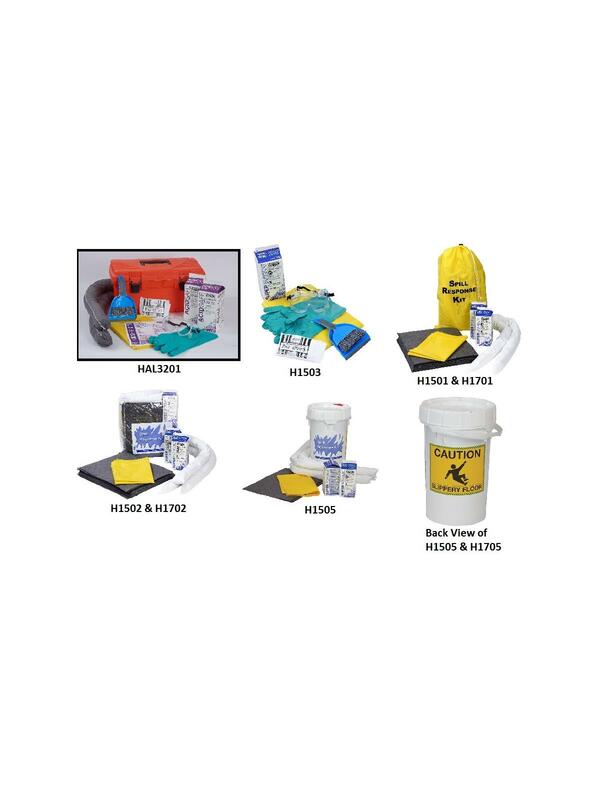 HAS1503-1 Contains: Acid Safe sorbents, gloves, goggles, apron, mini-broom & dustpan and disposal bag/4 pack. H1503 Contains: Carton sorbent, gloves, goggles, apron, mini-broom & dustpan and disposal bag - 6 Mini Kits per case. All Spill Kits illustrations are shown as "Universal". The gray sorbents changes to white sorbents on Oil Select Kits.